The Los Angeles City Council overwhelmingly approved a boycott of Arizona-based businesses and governments Wednesday unless the state repeals a new law giving police the power to question a detainee's immigration status. President Barack Obama on Wednesday proposed a package of measures that would provide $118 million in additional funding for oil spill relief efforts and raise the tax that oil companies pay to maintain an emergency fund. The Gulf Coast oil spill continues to dominate the news as Rep. Henry Waxman, D-California, revealed that the oil company privately told the Energy and Commerce subcommittee on oversight that the well failed a key pressure test just hours before it exploded on April 20. People still want to know more about Solicitor General Elena Kagan, President Obama's nominee to the Supreme Court as she began making rounds to the offices of key senators on the Hill amid criticism from Republicans. Stocks rallied Wednesday, with the Dow logging triple-digit gains, as European debt noise faded and investors focused on an improving domestic economy and corporate earnings. the first time above last Wednesday's close, before turmoil swept through the market, culminating in last Thursday's flash crash. The S&P 500 index added 16 points, or 1.4%, and the Nasdaq composite rose 50 points, or 2.1%. Tech and industrial stocks led the advance. Shares of Intel, IBM and Cisco Systems, which reported its best quarter even after the close, finished up more than 3%. Manufacturers Boeing, Caterpillar and Du Pont gained more than than 2%. doing well on good days," said Paul Radeky, president of KDV Wealth Management, noting that investors are gaining confidence in riskier assets, such as stocks, because corporate earnings are coming in strong. Oil prices slipped Wednesday after a weekly supply report from the government's energy agency showed an increase in oil stockpiles. Crude for June delivery slipped $1.06 or 1.4%, with oil settling at $75.65 a barrel Wednesday. Gasoline prices fell for the sixth day in a row, slipping to $2.896 a gallon from $2.901 the day before. What's moving the market: A report by the U.S. Energy Information Administration showed crude supplies grew by 1.9 million barrels last week, slightly more than the 1.7 million analysts expected. The dollar regained ground against the euro Wednesday in a thin trading day as investors remained skittish about European debt concerns. The dollar rose 0.3% against the euro to $1.2618, and 0.9% versus the pound to $1.4823. The U.S. currency was up 0.5% against the Japanese yen at ¥93.14. The euro had gained earlier, after a report released early Wednesday showed the euro zone's gross domestic product grew 0.2% in the first quarter. This was in line with analysts' estimates. The pound lost ground amid political concerns over the Britain's leadership. Analysts believe the overseas concerns led investors to flee to the dollar, which is considered a safe-haven currency, according to Michael Woolfolk, senior currency strategist at Bank of New York Mellon. Treasurys declined Wednesday as the euro zone showed signs of improvement and investors awaited the results of a $24 billion auction. What prices are doing: The benchmark 10-year note fell 10/32 to 100-16/32 and yielded 3.57% from 3.53% on Tuesday. Bond prices and yields move in opposite directions. 2-year note edged down 2/32 to 100-9/32 with a 0.87% yield. The 5-year note dropped to 101-2/32, yielding 2.28%. Increased confidence in the market on Wednesday led investors away from the safety of government-backed bonds and into riskier assets like stocks. A gray whale's appearance last weekend off the coast of Israel has left scientists blubbering. "We were shocked," said Oz Goffman, an expert in marine biology and animal behavior with the Marine Mammal Research and Assistance Center at Haifa University. "They are not animals that we are supposed to see in our area." A resident of the People's Republic of China has been convicted in San Diego, California, after a four-year investigation and prosecution on charges stemming from his efforts to find equipment to monitor U.S. government and military communications. Filed under: China • Espionage • Justice • U.S. The Pentagon has signed nearly $900 million in contracts with European and Asian companies that also do business with Iran's energy sector, congressional investigators told a Senate committee Wednesday. Filed under: Iran • Military • U.S. 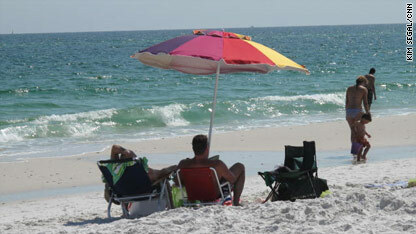 The beach at Pensacola, Florida. Officials in Florida would like the world to know that the state's 663 beaches and the water that surrounds them are oil free. A message that Florida Gov. Charlie Crist wants $34.75 million to spread. In a letter to BP, the company at the center of the oil spill problem in the Gulf of Mexico, Gov. Crist asks for the money to start a marketing campaign. This campaign would "counter the negative, widespread and false information potential visitors to Florida are receiving," a statement from the Governor's Press Office says. It's not just Florida's $60 billion tourism industry that is being impacted by misperceptions about the location of the oil slick, Florida¹s seafood industry is also feeling the effects. Out-of-state retailers have decreased their orders for Florida seafood and charter boats are reporting a large number of cancellations. "People seem to think our seafood is bad and our waters are contaminated, even though the oil spill is nowhere near our coast," says Liz Compton from Florida Department of Agriculture and Consumer Services. While Florida officials work on getting their message of an oil free state out to the public, crews continue to work around the clock to try and stop the leaking oil. Director Adam Shankman and Miley Cyrus at the premiere for "The Last Song." Miley Cyrus - She warned us, maybe we just weren't listening. At first she was just being Miley. Then she was partying all over the country (and dancing on what some people called a stripper pole.) That was followed by a message from the clearly over-being-a-Disney-aged-star singer saying she can't be tamed. She's still got her contract with Disney, but her recent videos and lyrics couldn't be sending a clearer message that our little Miley wants to break out of Disney's cage - Scuttle style - and not be viewed as just a kid anymore. It also has sparked a debate about whether Cyrus, who is still in her teens, has been acting age appropriate. On Wednesday the debate continue after TMZ posted a video of her dancing with 44-year-old director Adam Shankman (of "So You Think You Can Dance," "A Walk to Remember," "Bringing Down the House," and "Hairspray" fame.) A photo of Cyrus and Shankman together when she was filming Shankman's movie "The Last Song" caused a similar uproar a few months ago on Twitter. "Lost" and Across the Sea - It looks like Losties are still searching for answers. With just a few more hours of the show left, last night's episode "Across the Sea" promised big reveals and big answers. But as usual in this show, there is one rule that normally holds true, the answer to most questions is another question. Based on the fact that "Lost" and the episode title "Across the Sea" are still trending at extremely high rates across social media sites, apparently they don't have their answers. So we are continuing searching, Tweeting, reading EW.com's Lost mythology codebreaker Doc Jensen's initial recap and waiting for his in-depth explanation that may make us have an "a-ha" moment. Two leading senators on Wednesday introduced a sweeping energy and climate change bill intended to cut U.S. greenhouse gas emissions while reshaping the energy sector for the 21st century. Two Russian-speaking men were arrested at Tegel airport in Berlin, Germany, after a witness overheard a "suspicious conversation" between them suggesting that a flight might be hijacked, police told CNN. [Updated at 12:04 p.m.] Afghan President Hamid Karzai thanked U.S. President Barack Obama on Wednesday for adding "considerable resources" to the U.S. presence in Afghanistan. Speaking after a meeting at the White House, Karzai said the two leaders had "a very frank and productive" discussion about, among other things, the protection of Afghan civilians in light of the stronger U.S. military campaign. He also said the transfer of local detention centers to the Afghan government was a "major point of progress" in the discussions. The disease baffling scientists has been called the white nose syndrome because it manifests itself as a white coat around the bat's nose. 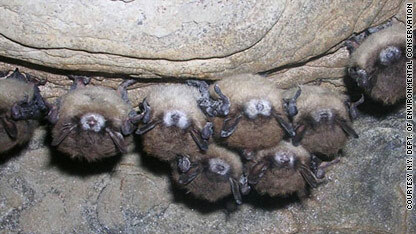 Wildlife agencies in all 48 of the contiguous U.S. states have been put on notice after a mysterious bat-killing disease – white nose syndrome – was recently detected west of the Mississippi River. The fungal disease, which has a 100 percent fatality rate, was first discovered in bats four years ago in Albany, New York, said Mollie Matteson, conservation advocate for the Center for Biological Diversity. [Updated at 11:49 a.m.] Three young boys were killed and two were injured in a bombing Wednesday evening in northwestern Pakistan, police told CNN. A roadside bomb was planted near a madrasa, or a religious school, said Muhammad Karim Khan, a senior Peshawar police official said. Khan said initial information indicated that the victims were madrasa students and between the ages of 15 and 20 years old. The incident occurred in the area of Dawar Bagh, around 30 kilometers, or more than 18 miles, southeast of Peshawar. [Posted at 10:55 a.m.] At least three people were killed and two others injured Wednesday in an explosion in Peshawar, Pakistan, police told CNN. Egyptian Customs officials found two undeclared firearms in the checked baggage of a passenger who arrived there from New York, the Transportation Security Administration said on Wednesday. Editor's note: This is the first of a three-part blog series on terrorist finances. In Part 1 we'll look at al Qaeda’s challenging financial situation. In Part 2 we'll examine at the Taliban’s money trail and in Part 3 we'll look at international co-operation (or sometimes the lack-thereof) in tracking terrorist financing. Bookmark our Security Brief section and check back Thursday for Part 2. Cohen’s job includes choking off the money supply to an array of terror groups. To that end, he spends plenty of time trying to persuade other governments – especially in the Gulf – to tighten their financial controls. Cohen is pleased with the contribution that Saudi Arabia – once the largest source of funds for al Qaeda – has made. For example, the Saudi central bank now has to approve transactions between accounts of more than $15,000. But senior Treasury officials say other Gulf states – such as Kuwait and Qatar – could do more to help. “We haven’t seen the same level of co-operation there,” the official says. A draft agreement on international adoptions between the United States and Russia will be finalized by Friday, Moscow's children's rights commissioner said Wednesday. Filed under: Adoption • Russia • U.S.
As Supreme Court nominee Elena Kagan plans to visit Capitol Hill and meet with senators Wednesday, one Republican lawmaker reiterated that he will oppose her nomination, just as he did 15 months ago when she was nominated for her current post as solicitor general. [Updated at 9:54 a.m.] New British Prime Minister David Cameron said Wednesday he supports the idea of fixed-term parliaments. "Now is the moment to do that," he said at his first joint news conference with Deputy Prime Minister Nick Clegg. Currently, parliaments can last as long as five years, but the sitting prime minister may call new elections at any point.